Well, the night has finally come; the 2017-18 NBA season is over. And, for the second season in a row, the Golden State Warriors are champions. They cruised to a 108-85 win over the Cleveland Cavaliers in Game 4, earning the first Finals sweep since 2007. This is now the third championship in the past four seasons for the Warriors. It was a pretty competitive Game 4 to start, as the Warriors jumped out to an early nine-point lead at the end of the first quarter, only to see the Cavaliers battle back and take a lead of their own in the second quarter. But the Warriors used a late burst to push their advantage back to nine points at halftime, and the Cavaliers never got closer. The Warriors used one of their patented third-quarter takeovers to seize control of the game. Up by 21 points at the end of the third quarter, they then cruised in the final 12 minutes. 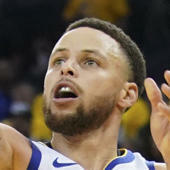 Steph Curry finished with 37 points, six rebounds, four assists, three rebounds and three steals, while Kevin Durant registered 20 points, 12 rebounds and 10 assists. It was another spectacular performance by the Warriors, but especiallyKevin Durant, who was named Finals MVP for the second straight season. Durant went to the Warriors in order to finally win a title, and now he's not only done that twice, but he's also captured two Finals MVP trophies. He's only the sixth player to win that award in back to back seasons. If you are unable to view the live blog below, please click here. The first quarter was all about 3-pointers for the Warriors. They knocked down six shots from long range to take a 34-25 lead after the first 12 minutes. All in all, they shot over 59 percent in the first quarter, as they once again did what ever they wanted on the offensive end. The Cavaliers showed some resolve by battling back in the second quarter, even taking the lead at one point. But all of their hard work was for naught, as the Warriors went into halftime with the exact same nine-point lead they held after the first quarter. Steph Curry hit yet another 3 to close out the first half, giving him 20 points for the half. Well, the Warriors did their usual thing in the third quarter. Leading by nine at the half, they boosted that advantage to a commanding 21 points heading into the fourth. The Cavaliers managed just 13 points in the frame, as they seemed to realize the fate that soon awaited them. Steph Curry takes it in for the up and under! There wasn't much to write home about in the fourth quarter. The Cavaliers had pretty much given up, and the Warriors didn't have to exert much effort to coast to the victory.